It was Ladies' Night at the 61st Grammy Awards earlier today, February 11th, as many women in the industry were put in the spotlight, contributing to becoming one of the most eventful award shows we’ve seen to date, with a number of notable “firsts." It all started with the show’s opening number featuring Camila Cabello performing a theatrical set of her song”Havana," which included J Balvin, Ricky Martin, Young Thug and legendary Cuban-American jazz trumpeter Arturo Sandoval. Not only did that performance kick off the night’s festivities with that infectious Latin flavor, it was also the first time a Latina had ever opened the prestigious awards show. 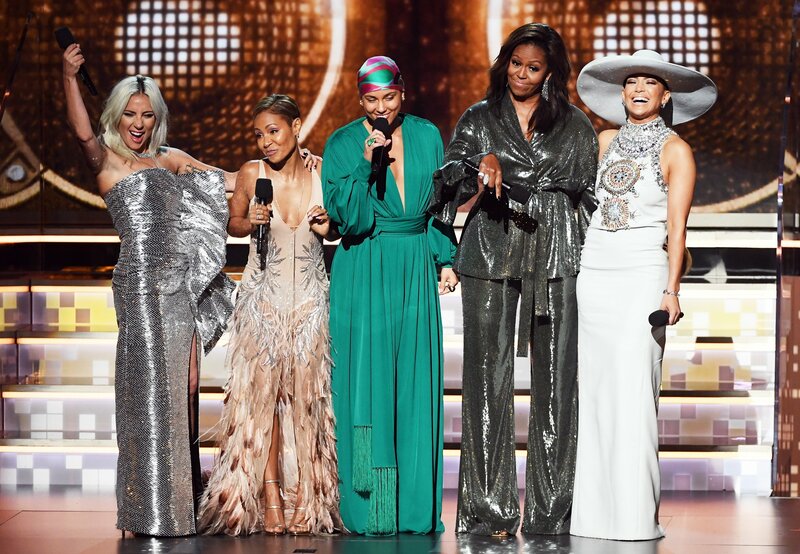 The rest of the night was followed of some of the grandest performances, including Cardi B’s larger than life performance of her song “Money,” Shawn Mendes and Miley Cyrus’ powerful duet of “In My Blood,” Janelle Monae making us feel all the feels with “Make Me Feel,” Lady Gaga and Mark Ronson’s poptastic performance of “Shallow” much different from the film version, Dua Lipa and St. Vincent’s head-to-head mash-up of their songs “Masseduction” and “One Kiss,” Alicia Keys taking a break from her hosting duties to play “The Entertainer” on TWO pianos simultaneously, H.E.R’s commanding performance of “Hard Place,” Brandi Carlisle’s heartfelt ballad“The Joke,” and Kacey Musgrave’s angelic conclusion to the evening with her song “Rainbow." Not to mention the traditional tributes that the Grammys are known for. This year they honored some iconic women in music: Dolly Parton, Diana Ross, and Aretha Franklin. Dolly headlined her own career tribute alongside her goddaughter Miley Cyrus, Katy Perry, Maren Morris, Kacey Musgraves and Little Big Town, and closed out with her hit “9 to 5,” which brought the crowd to its feet. She's the first country artist to be saluted in the tribute's 29-year history. And of course, the night would not be complete without awarding the industry’s greatest artists. Some of the most historical wins came from Cardi B, who went on to win Best Rap Album, making her the first solo female act to win this category; Dua Lipa who was hailed Best New Artist; half Filipina artist H.E.R. who took home the awards for Best R&B Album and Best R&B Performance for “Best Part” with Daniel Caesar; Kacey Musgraves won Album of the Year; and Childish Gambino who won Song of the Year, Best Music Video, Best Rap/Sung Performance, and Record of the Year with his song “This Is America." Did any of your favorites win any Grammys? Comment below!